Backed with a 5 year manufacturer's warranty, this dehumidifier is a great tool to place in your gun safe to help remove moisture from the air. You've spent a lot of hard earned money building up a prized collection of firearms and if you live in a high-humidity area, then you need to protect that investment. This dehumidifier is a self-contained unit which is rechargeable by simply plugging into a standard 110v wall socket. Depending on the level of humidity, this unit can last up to 60 days without recharging or if you live in a higher humidity area, it will have to be recharged more regularly as it's working overtime. 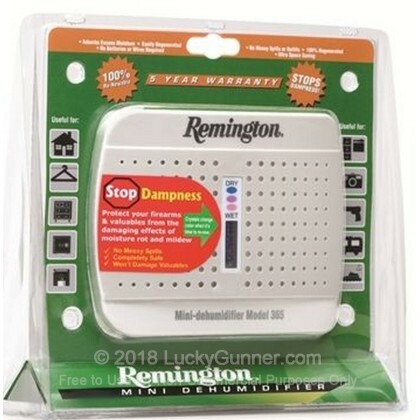 Remington's dehumidifier is designed to attract and hold moisture through water crystal technology to protect the contents stored in gun safes. To know when it's time to recharge, simply look at the indicator which will notify you when it's time.... It's that easy!